Almir Surui was ten years old when the first logging truck came to his tiny village deep in the Amazon Rainforest. It came to chop down a single stand of centuries-old mahoganies, and it came with the grudging approval of the chiefs. After all, they reasoned, it was just one truck, one stand, one time, and for a good cause. Long an isolated and almost mythic people of the Amazon, the Paiter-Surui were first contacted by Brazilian authorities in 1969. Numbering 5,000 at the time of First Contact, more than 90% of them died of tuberculosis and smallpox before Almir was born in 1974. He grew up under siege – from white invaders on one side and displaced indigenous people on the other. By 1983, however, things were looking up. The Paiter-Surui (often just called “Surui”, the name Brazilian authorities bestowed upon them after misinterpreting a neighboring people’s name for “enemy”) had won demarcation for their territory from federal authorities, and they were keen to shift their strategy away from war and bloodshed and towards politics and commerce. That meant they needed money for travel to and from Brasilia. The loggers offered to cover that expense in exchange for one stand of trees – worth, it turns out, orders of magnitude more than what the Surui received for them. The trucks came by the scores on roads built with money from the World Bank’s Polonoroeste initiative (the “Northeast Pole Northwest Region Integrated Development Program”). By 1986, high-ranking officials from the Indigenous Affairs Agency (Fundação Nacional do Índio, FUNAI) were encouraging the logging operations in exchange for kickbacks from timber companies, and Almir – though barely into his teens – became one of their most vocal critics. It was a cost not limited to logging, and not borne just by the Surui. By 1988, Almir had achieved an impressive academic record which – together with his eloquent critique of logging – earned him a spot at the Centro de Pesquisa Indigena. The brainchild of indigenous leader Ailton Krenak, the Centro brought young Indigenes like Almir out of the rainforest and into the Universidade Federal de Goiás, where he studied applied biology. Upon graduation in 1992, he was elected chief of his clan, the Gameb. He dutifully married and settled into his village, where he planned to implement a sustainable agriculture program. Tribal elders – most of whom were under 40 themselves after the devastating plagues of the 1970s – had other plans. The Rio Earth Summit had just launched the United Nations Framework Convention on Climate Change (UNFCCC), and the World Bank had just launched the Rondônia Natural Resources Management Project (Planafloro), which was an effort to right the wrongs visited by Polonoroeste. Unlike its predecessor, Planafloro created a vehicle for the active involvement of forest people and local NGOs. Almir, though not even 20 years old, was elected head of CUNPIR (Coordenação ads nacoes de Povos Indígenas de Rondônia, Sul do Amazonas e Norte do Mato Grosso/the Coordination of Nations and Indian Peoples of Rondônia, Southern Amazonas and Northern Mato Grosso), which represented indigenous groups across three Brazilian states. It was a position that soon brought him into conflict with organizations he had long admired, some of which had been helping indigenous peoples in Rondônia since the early 1970s. He first encountered that paternalism after CUNPIR tried tracking the Planafloro funds that were going into FUNAI coffers. They found much more was going in than coming out, and little of what disappeared was being accounted for. Experiences like this sparked his lifelong quest to develop sources of income that are independent of charities but don’t require the destruction of trees. By the late 1990s, Almir had become a recognized political figure in the state of Rondônia, where the bulk of his territory is located, but he didn’t feel he’d done much for his own people. So he resigned his position at CUNPIR and dedicated himself to reorienting the tribal economy towards sustainable products such as non-timber forest goods, handicrafts, ecotourism, and organic agriculture. The Surui, however, were completely dependent on aid and income from logging for their food and health-care. They lacked the agricultural expertise to implement his sustainable land-use program, and they lacked the business acumen to market such products even if they could produce them. Plus, impoverished members of his people had a hard time focusing on potential income from new activities when they could accept concrete bribes from loggers today. Gradually, Almir conceived a 50-year economic redevelopment plan that would build up the required expertise by introducing sustainable sources of income where possible, providing reliable healthcare and – critically for the creation of a sustainable economy – teaching the skills needed to thrive in the modern world. But the sine qua non was a solid governance structure, and for that he still needed the support of international development agencies like the Norwegian Agency for Development Cooperation (NORAD), which had long helped with health care, and the United States Agency for International Development (USAID). Both were instrumental in helping the Surui build up and maintain inclusive governance across the territory, and USAID continues to support such activities to this day. "One day, we'll ween ourselves of that, too," he says. "That's when we'll know the 50-Year Plan is succeeding." In 2004, all four Surui clans were feeling the precariousness of their situation, and each was looking for a way to feed their people if and when the aid dried up. The clan chiefs convened a meeting to discuss their business proposals. One of the chiefs wanted to ramp up logging. One wanted to dig for gold or diamonds. And one wanted to bottle water. Almir said he wanted to plant trees. He was promptly ridiculed by everyone in the room, including those within his own clan. After the meeting, he went into town, logged onto his computer, and typed “reforestation Amazon” into Google. The first hit was a Swiss organization called Aqua Verde. That meant he was offering compensation for a clear and tangible outcome – the kind of economic activity that Almir wanted to nudge his people towards. While waiting for that funding to come through, he learned that the Amazon Conservation Team (ACT) had worked with another indigenous people, the Xingu, to create a “cultural map” of their ancestral land. The map identified sacred burial grounds, traditional hunting grounds, and historic sites, among other things. Such a map, he reasoned, could help him formulate a management plan and also promote cultural cohesion among his people. In December of 2004, he approached ACT, which secured a grant from the Annenberg Foundation to develop a cultural map of the territory. What’s more, through ACT he developed a deep and lasting friendship with Vosco van Roosmalen, then head of ACT Brazil, which eventually broke off to form a separate entity, Equipe de Conservacao da Amazonia (ECAM). Dangling the mapping project, with its temporary jobs and its promise of cultural revival, as a carrot, Almir was able to win support from other chiefs for a moratorium on logging. When the mapping project started, the logging stopped – but that earned him the animosity of loggers, who placed a $100,000 bounty on his head. For two years, he was looking over his shoulder. That ended when the mapping project drew to a close and logging started creeping up again. Almir was once again on the road with his hat – and his cultural map – in his hand. In 2007, Almir logged onto Google Earth for the first time. That doesn’t mean it wasn’t beautiful. In fact, he clearly saw the way his territory stood out as a sort of oasis of green in a sea of yellow and gray. It was shaped almost like an arrow, and surrounded on all sides by dead land and farms. With a trip to San Francisco already in the works, he convinced van Roosmalen to arrange a meeting with Rebecca Moore, who manages Google Earth Outreach. She remembers the conversation well. But then Almir stood and told the story of his people: of how they had long defended their territory with bows and arrows, and how they shifted to pen and paper, and were now shifting to computers. At her request, he unfurled the cultural map, which he had rolled up in a sheath. She called in other “googlers”, as employees call themselves. Among them was John Hanke, the man who founded Keyhole, which Google bought in 2004 and rechristened “Google Earth”. She says Almir pointed at his map, and then he pointed at her computer, and then he asked why his territory was blank on Google Maps and Google Earth. “If you go to Sao Paulo or Rio, you see cultural information,” he said – by Moore’s recollection (Almir says he goes on autopilot when he speaks, and rarely remembers what comes out of his mouth). Whatever the exact words, he left with Google’s firm promise to put his territory on their maps – a promise they have kept in spades. 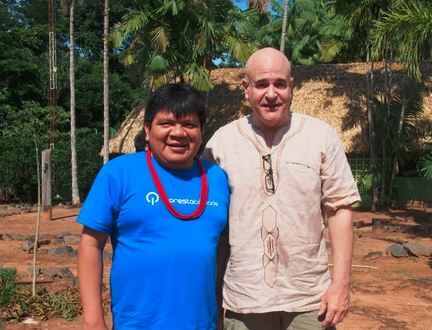 On the same trip, he ran into Beto Borges, who runs the Communities and Markets initiative of environmental non-profit Forest Trends (publisher of Ecosystem Marketplace). The two had first met in Almir’s days at the Centro, and Borges had even written his master’s thesis on Surui efforts to develop a sustainable agriculture program. Borges told him there was carbon funding for planting trees and carbon money for saving trees. Forest Trends commissioned a study to make sure indigenous people did, in fact, have the legal rights to generate income from the carbon captured in their trees. Then Almir and Borges pieced together a network of NGOs, consultancies, and lawyers, each with a different role. Almir brought in ACT and the Associação de Defesa Étnica e Ambiental Kanindé (the Association of Ethnic and Environmental Defense, or “Kanindé”), with whom he’d been working since the early 1990s, while Borges brought in the Instituto de Conservação e Desenvolvimento Sustentavel do Amazonas (The Institute for the Conservation and Sustainable Development of Amazonas, or “Idesam”) and the Katoomba Incubator, a project of Forest Trends designed to support new initiatives that can then be replicated around the world. The first job was to explain the project to the tribe and see if they understood it and supported it. Representatives of Kanindé and ACT spent months visiting remote villages and explaining the concept. Then they needed to see which parts of the forest were really in danger – a task that fell on IDESAM. They looked at other indigenous people who had faced the same needs as the Surui and then calculated the amount of forest that would likely be destroyed through continued logging and eventual conversion to farmland. They concluded that, of the 248,147 hectares that comprised the Surui territory, at least 13,575 hectares would have to be converted to farmland over the next 30 years if the people were to survive – an amount that translates into 7.8 million tons of carbon dioxide. If the Surui instead saved that forest, they would avoid more than 90% of that deforestation, and could expect to earn carbon credits for roughly 5 million tons after accounting for uncertainty. Almir presented the plan to the Forum of the Clans, and explained that all income would go into a fund to develop schools and jump-start the 50-Year Plan. Once they understood the concept, the other chiefs agreed to unilaterally implement a new moratorium in 2009. Soon there were more death threats, prompting ACT and then ECAM to send Almir abroad for his own safety. During these trips, he continued to promote the project and raise funds to keep his people going while waiting for the project to kick in. Then they made their case to the Verified Carbon Standard (VCS) that without carbon finance, they would have to destroy that much forest. They also made their case to the Climate, Community, and Biodiversity (CCB) Alliance that they would preserve the forest in a way that conserves biodiversity and supports their culture. For three years, the bulk of his people resisted logging, as the tribe subsisted on funding from USAID, NORAD and others. As the years went on, however, the moratorium began to take its toll. A small but vocal minority called for the resumption of logging. In 2010, Almir was named Labiway Esaga – the overall chief of all Surui clans – but his leadership was about to be tested. In June, 2012, VCS auditors “validated” the project – meaning they signed off on its design. That meant there was agreement that without carbon finance the Surui would have to chop a certain portion of their forest to survive. It also meant that the steps the Surui had outlined for preserving that patch of forest made sense. The next step was the critical one – this was the “verification” phase, where auditors from the Instituto de Manejo e Certificação Florestal e Agrícola (Institute for the Management and Certification of Forests and Farms, or “Imaflora”) and the Rainforest Alliance would look to see that the Surui were, in fact, doing what they said they would do to ensure that those steps were, in fact, being taken. IDESAM immediately began reviewing satellite images to begin the validation and quickly realized that a 2010 fire in the territory had taken more land than the Surui had realized. “That fire took ten days to put out, and we had reported it as best we could, but we hadn’t realized how extensive the damage was until we saw those satellite images,” Almir says. “The very day that we got the good news about the validation, Idesam told us that the fire damage meant we’d have fewer credits than we thought we would." Fortunately, as the verification process continued, auditors found that their loss wasn’t as bad as they had feared. Logging threats escalated, however, and when police uncovered evidence of a bungled attempt to collect the bounty on Almir's head, federal authorities responded by providing bodyguards from the elite Força Nacional. As the year dragged on, a Surui patrol found evidence of recent activity on an old logging road, so Almir turned to local authorities for help. When they demanded proof, he started tracking the loggers and documenting their actions. When authorities still refused to act, he began posting images onto the internet and using both local and international media to ratchet up pressure on authorities to act. He also called out members of the Surui who he believed were colluding with loggers. Meanwhile, the verification process was still underway, and the Surui were lining up buyers. Natura was all but sold on the deal by early 2013, but the Surui wouldn’t have credits to sell until the project was verified. That happened in May, 2013, and in August Natura officially made its purchase, which was announced last September. Re-Posted from Ecosystem Marketplace. You can view the original here. Steve Zwick is the Managing Editor of Ecosystem Marketplace and is working with Chief Almir on his Autobiography. He can be reached at szwick@ecosystemmarketplace.com.